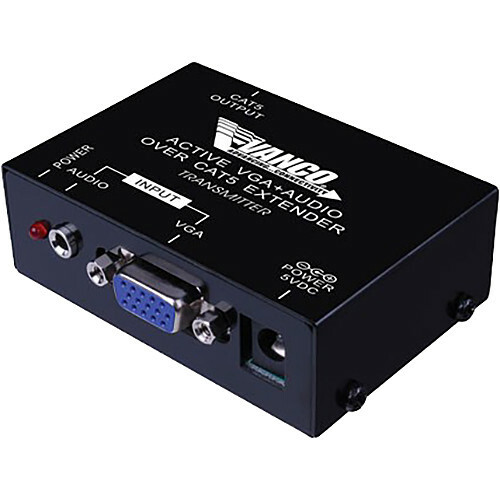 Place your display in just the right location with this VGA over Cat 6/5e with Audio Extender Set from Vanco. This extender set allows you to connect a video and audio source such as computer with a monitor, TV, or projector, or with speakers or a receiver up to 500' away. The transmitter and receiver included in this set are powered by included 5 VDC power supplies. The transmitter box offers a VGA input and a 3.5mm stereo input for your audio source. The video and audio are output over an RJ45 port and 640 x 480 video can travel up to 500' at over a single Cat 6 or Cat 5e cable. The setup also supports transmitting 1600 x 1200 video up to 198' feet away. The receiver box has an RJ45 input and also has a VGA and 3.5mm output for connection to your monitor, TV, or projector. It also features adjustable EQ for boosting the signal. See below for more detail about supported resolutions and transmission distance. Box Dimensions (LxWxH) 7.0 x 4.6 x 3.1"